As an orthodontist who serves an area rich with highly skilled and intelligent individuals, I get to know many wonderful people. My profession enables me to cultivate and transform unhappy smiles into glorious smile, and make a lasting and positive change for every patient. I love working with younger patients: seeing kids develop and grow into teens who are confident, responsible, and happy with themselves. I’m given the rare opportunity to influence these people; I can encourage them to do their best in all things, and I love that. I equally love to create amazing smiles for my adult patients, many of whom have waited years to get their perfect smile. Continuing education is essential to provide the best possible treatment outcome using the most advanced techniques. I complete several courses each year, through the American Association of Orthodontists, the Southwestern Society of Orthodontists, and the graduate departments of orthodontics at Saint Louis University and the University of Texas. In addition, I attend quarterly orthodontic study club meetings through the Water’s Edge Orthodontic Study Club. I also attend monthly meetings with the Ninth District Dental Society, where the latest advances in oral healthcare are presented and discussed. In 2010, after intensive study, case presentations, and an oral examination, I was honored to receive my board certification from the American Board of Orthodontics. My continuing education empowers me to offer patients the latest treatment options. 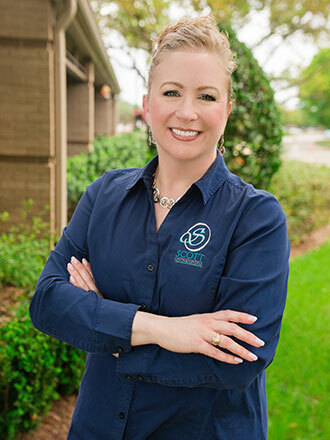 In my pursuit of excellence, I seek to provide patients with the best care for their situation and deliver the treatment with comfort and ease. I love what I do. Creating beautiful smiles is tremendously gratifying, and interacting with people of all ages is always fascinating. I appreciate the joy my patients bring to the practice. Watching each person’s smile and personality bloom, as well as their sense of accomplishment when they’ve completed treatment, is personally and professionally fulfilling. I grew up in Conroe and love living in Seabrook now. My wonderful husband, Craig Scott, and I married during my first year of dental school. We have a beautiful daughter, Sarah, and two ultra-friendly Tonkinese cats who act like they’re dogs! When I’m not at the practice, I love riding my bike with Sarah in the attached trailer. I also enjoy making beaded and wire jewelry with her. As a way of giving back to our wonderful community, I often give talks at local elementary schools. I also provide booster support to our patients’ extra-curricular activities, and sponsor many school sports and dance teams.